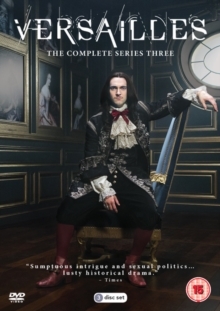 All ten episodes from the third series of the historical drama starring George Blagden as French monarch Louis XIV. In a bid to strengthen his weakening position among the country's elite, Louis decides to move the French court from Paris to Versailles. However, with the Parisian nobility deeply opposed to the move, Louis is faced with negotiating a dangerous cycle of lies, deceit and vicious political manoeuvrings as he attempts to exert his authority. In this series, Philippe (Alexander Vlahos) returns to Versailles with a prisoner in tow, Louis faces criticism in response to his tax proposals by the Parisian people and the Queen decides to flee to Spain to tend to her dying brother when she comes under threat. The episodes are: 'Smoke and Mirrors', 'Question of Trust', 'The Truth Will Burst', 'Crime and Punishment', 'The Beyond', 'The Wheel of Fortune', 'The Book of Revelations', 'Men and Gods', 'The Powder Keg' and 'The Legacy'.